On 18th December 1915 the President of the United States, Woodrow Wilson, married Edith Bolling Galt. 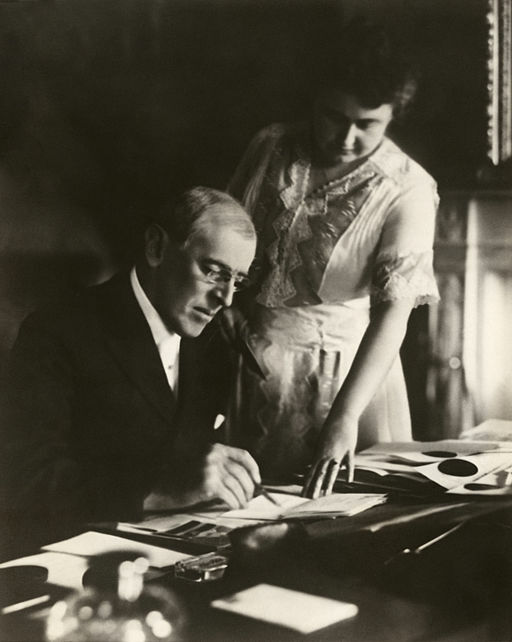 It was a second marriage for both of them – President Wilson had been widowed in August 1914, suffering severe depression as a result, and Edith had lost her first husband in 1908. She was 43 years old when she married the President, who was a few days short of his 59th birthday. This marriage proved to be significant in ways that could not have been predicted at the time. One positive (and fairly predictable) outcome was that Woodrow Wilson’s mood was lifted sufficiently for him to campaign successfully for re-election in 1916, although his win was by a slender margin. However, the following year the United States entered World War I and Wilson gave earnest thought not only to winning the war but also to what the world should look like after victory was achieved. The peace treaty that was signed at Versailles in 1919 owed much to Wilson’s blueprint as outlined in his “Fourteen Points”, the last of which was a proposal for a post-war international council that would work for global peace. Unfortunately, Wilson’s strenuous efforts had a disastrous effect on his health, and he suffered a massive stroke in September 1919 that nearly killed him. Edith Wilson then became part of a cover-up to pretend to the American people that their President was not as ill as he really was. She acted as a go-between and a buffer, so that the President would be seen by as few people as possible during his recovery. The business of government had to continue, but it did do, as far as possible, without the participation of the President. He took very little part in public affairs for the rest of his term of office and was not strong enough to attend the inauguration of his successor, Warren Harding, 17 months after he had had his stroke. The ideal solution would have been for Woodrow Wilson to have resigned his office in favour of his Vice-President, Thomas Marshall, but the small coterie of White House insiders, led by the First Lady, would not allow this to happen. The biggest casualty of this situation was Woodrow Wilson’s pet project, the League of Nations, for which he had been campaigning strenuously when he suffered his stroke. Wilson clearly wanted the United States to be a leading member of the League but there was stiff opposition from Republicans in the Senate, who regarded any participation in a world body as being a constraint on unilateral action by the United States. A compromise position could probably have been reached, but Wilson, his mind befuddled by his physical condition, refused to budge and would not allow anyone else to negotiate on his behalf. As a result, the League of Nations that emerged after World War I did not have the United States as a member. There thus emerges one of the great “what ifs” of history. If the League of Nations had had American membership, would it have been better placed to preserve world peace, and could World War II have been avoided as a result? As things turned out, the League’s lack of authority made it very easy for countries such as Germany, Italy and Japan to ignore it and walk away. If Edith Wilson had had less concern for preserving the status of her husband (and herself), might the United States have had proper leadership at this highly volatile time in world history? It is often the case that wider concerns need to take precedence over personal loyalty, and this would appear to be a clear example.